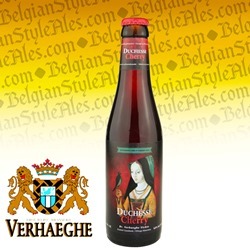 Duchesse Cherry (ABV 6.8%) from the Verhaeghe Brewery is a blend of 1 and 2 year old Duchesse De Bourgogne (Duchess of Burgundy in English – their flagship brew). It's aged in oak casks, with whole sour cherries from the Limburg region of Belgium added to the maturing beer (as opposed to the cherry syrup that is sometimes used in cherry beer production). The brew pours a clear, dark reddish brown with a small tan head, and emanates aromas of tart sour cherries, bread, apple, toffee, and vanilla. Taste follows the nose, and includes wine-like notes of oak and astringent dark fruit. The mouthfeel is smooth and medium-bodied, while the finish is crisp, bittersweet, and dry – a refreshing cherry ale with food-friendly acidity. Like Duchesse de Bourgogne, it pairs well with buttery cheeses, spicy peppers, roasted turkey, venison, lamb, or prime rib. It would be the perfect beer to match with (or feature in) a sorbet; also goes well with rich and dense desserts. The Verhaeghe Brewery was founded in 1885 by Paul Verhaeghe in the village of Vichte in the West Flanders region of Belgium. It was a commercial success until the outbreak of the First World War, but when Verhaeghe refused to cooperate with the occupying German forces and simply ceased brewery production, the Germans responded by dismantling the brewery. It would take decades after the war for the brewery to find its footing again. With the resurgence in popularity of artisanal craft beers in the 1970s and 1980s the brewery began to see success in the modern era. Still owned and operated by the Verhaeghe family, the brewery now distributes its traditional ales to a number of countries in Europe as well as the United States, Canada, Italy and Japan.